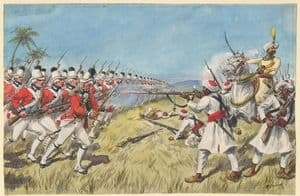 The Siege of Cuddalore was a siege attempt by British troops against a combined French and Mysorean garrison in the fortress of Cuddalore late in the War of American Independence and the Second Anglo-Mysore War. The siege was ended by the preliminary peace between France and Britain. 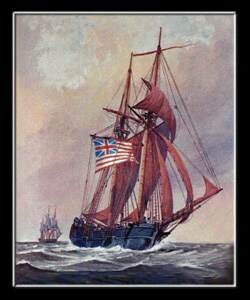 British troops under the command of James Stuart arrived outside Cuddalore on 7 June 1783. This army consisted of the 73rd and 78th Highlanders, and the 101st regiment, with a considerable body of Sepoys, and was subsequently reinforced by a detachment of two regiments of hired Hanoverian (German troops) under Colonel Christoph August von Wangenheim. On the 6th of June, the army took up a position on sandy ground two miles distant from the garrison, with its right on the sea, and the left resting on the Bandipollum hills, having a second line in reserve in the rear. The French and Mysoreans, commanded by Marquis de Bussy-Castelnau took up an intermediate position, nearly parallel and half a mile (0.8 km) in front of the fort. On the 13th of June Stuart decided to attack the redoubt in front of the fort in order to press the allies harder within Cuddalore itself and to be more fully prepared for siege operations. The assault took place at four in the morning to gain the element of surprise but attacks and counterattacks by both sides kept on going until five in the evening. Eventually the allies were driven from their principal defences on their right and the last allied counterattack was defeated. By mutual consent a cessation of firing took place as casualties were enormous. The allies had suffered serious losses of nearly 500 casualties men of which they could ill afford, and they lost thirteen of their guns. Stuart’s forces too had suffered heavily: over 900 British, Hanoverian and their sepoys were killed or wounded, significantly weakening the force for the siege. However Stuart now in his wanted position made no hesitation in laying siege to Cuddalore proper and in addition prepared for further reinforcements from the sea. 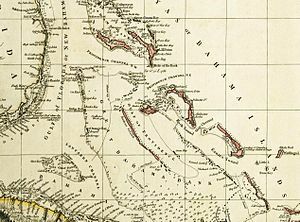 Key naval support for the British was interrupted on the 20th by the arrival of a French fleet under the Bailli de Suffren, which met the British fleet in naval battle, and forced it to withdraw to Madras. Suffren with this advantage was able to land 2,400 soldiers, marines and sailors in support of de Bussy’s garrison resulting in nearly equal-sized forces. De Bussy with this additional reinforcements had now enough men to launch a sortie on the British siege works. Stuart, aware of the newly arrived French reinforcements, prepared for a major attack. On the 25th June the French made repeated sallies on the British lines. After making some progress initially the French were not able to press home their advantage and shortly afterwards Stuart was able to counter-attack and repel the remaining French assaults. De Bussy called off the attack after realising no progress had been made at all and at heavy cost. The assault was a disaster and De Bussy realized he had lost a great opportunity in defeating the besiegers especially with the reinforcements he had received. French morale plummeted as they had lost the advantage in numbers and now realised the balance had swung back in favour of the besieging British. The British had lost no more than 23 men killed and wounded, while De Bussy’s attacking force had lost 450 killed and wounded; another 150 were taken prisoner. A number of French officers were captured, including the officer who led the assault, the Chevalier de Dumas, who was captured unwounded. Among the French prisoners was a young sergeant in the French marines who was also wounded and had landed from Suffren’s squadron on 20 June; Jean Bernadotte later became a Marshal of France and more famously was crowned the King of Sweden. The siege continued for another five days but by now both sides were weakening due to disease and growing casualties. Stuart’s forces were being taken apart by disease at a higher rate than De Bussy’s were. Stuart was also writing vicious letters to the Madras government complaining that he had been abandoned and left to fate. De Bussy though prepared for another attack, this time by a more circuitous route directed at the main camp of the British and Hanoverians. This however never materialized as a British frigate arrived on 30 June with news of a preliminary peace between France and Britain. A cessation of hostilities, complicated by the fact that Mysore and Britain were still at war, was negotiated on 2 July. In the Peace of Paris (1783) Cuddalore was returned to Great Britain in exchange for Pondicherry and Mahé, two French territories that Great Britain had captured earlier in the war. Fighting continued between the British and Mysoreans until the Treaty of Mangalore was signed in March 1784.